Some days, you search for the patterns. Some days, the patterns find you. Some days, its a little of both. It becomes even more of both when a friend presents you with something interesting you’ve never knit before, but is close to the Sock Monkeys, you are known for. It’s even more interesting when that friend is full-grown man who plays video games and has a collector’s personality. I received a facebook message from a friend asking if I could knit him one of these: http://www.sheezyart.com/art/view/2413993/ with a photo of the image included. I looked at it and asked for a knitting pattern, since this version is crocheted. The person making this one made it smaller than mine, but I began the search and found a pattern with said friend’s help. We settled on one pattern, and I began knitting mini socks, that were almost like baby booties. The pattern said to knit the body first, but the “socks/booties” were tougher and there were four of them. If I could get them done, finishing the body should be easier and like a long home stretch. The four “sock” legs knit up easier than I thought, but still provided some challenge as they were tiny, but too long for baby booties. Though, they were almost as cute. 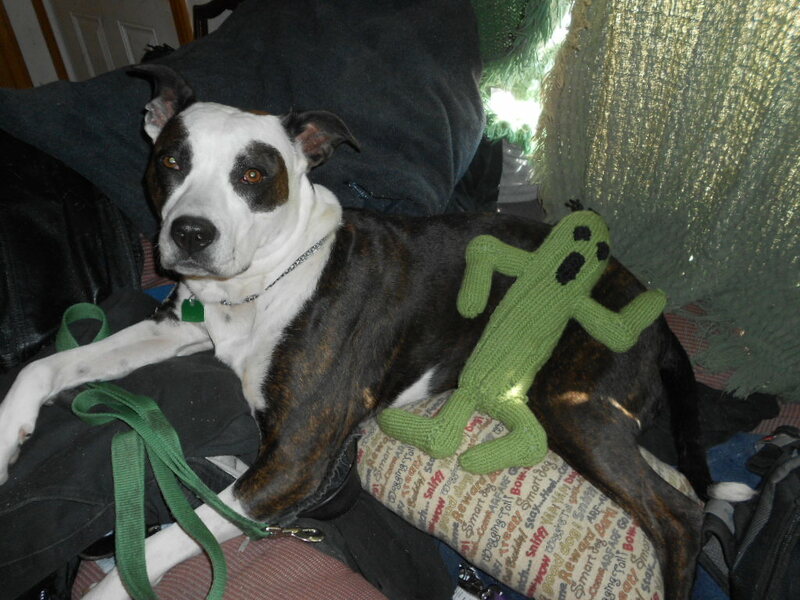 I have to mention the yarn color here, as cactuars are almost pea-green in appearance. I had an asparagus green yarn that has been deemed ugly. It was passed on to me from someone from the generation of avocado green kitchen appliances. I also had a really cool two tone green novelty ribbon yarn by ice, but it refused to knit up in a reasonable size which I could make this pattern from. So, off to the stores to search the correct skein of yarn. While my friend offered to pay for the yarn or provide it, I knew about what I wanted to work with. I searched for something like Caron Simply Soft for this, or a cotton based green yarn, but neither had a good enough green that would look like a cactus. 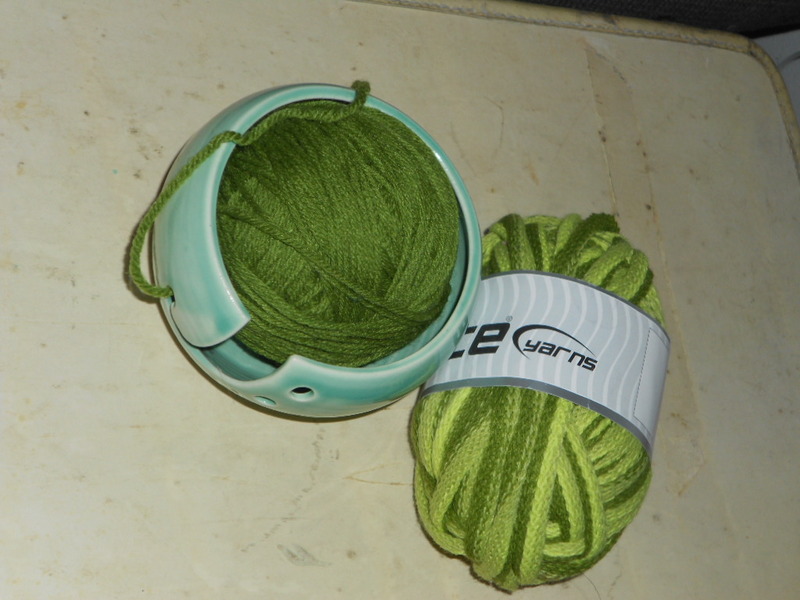 I looked at more specialty yarn, but did not find the right green, nor a good texture. I also wished to keep it affordable. So, after searching, and searching, the only green I liked was made by Red Heart. Confession time: I am a yarn snob. While I will use acrylic and find it splits if I’m not careful in my knitting, I draw the line at Red Heart yarn as it has a scratchy feel I do not like. However, this was different version, called Red Heart with Love, and was apparently washed before it was sent to market. It didn’t have the scratchiness I’ve associated and found with every skein of Red Heart since I’ve begun knitting. I picked a pound of a color called ‘lettuce’ and took it home to finish the ;Gotta Love Me’ Monster in last week’s post. 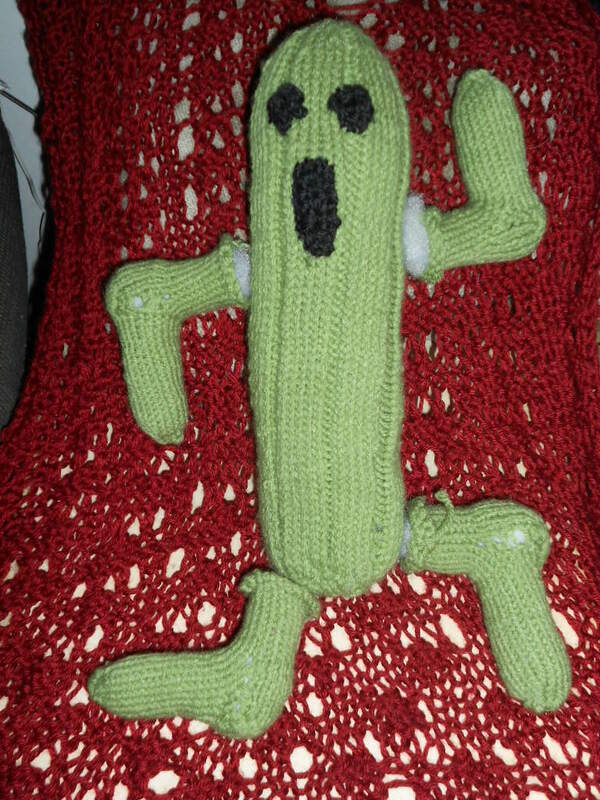 Then I started knitting the Cactuar using the Red Heart with Love yarn and was surprised at its softness. I knit the four sock booties, then began the body with a few knit stitches and a couple of purl stitches. The true fun of knitting this body, since it was a lot of the same thing for 10 inches of knitting in the round, was taking it into work. I work as a substitute teacher and find myself in different classrooms often. A repeat classroom, though increasingly common, is still rare. When I have downtime in class, or on breaks, I often knit. When I need time fillers at the end of the day, I pull out my knitting and demonstrate or explain the project. Each time, the sock monkeys, the monster, and the cactuar has engaged the imagination of many children, but the Cactuar perhaps most of all. Perhaps, I simply had more opportunity to present the Cactuar to the children I worked with. I was pretty impressed. At the end of my presentation, once the teacher had returned, he politely raised his hand to thank me for showing him my knitting. I wish all of my classes were as good as this fourth grade class. 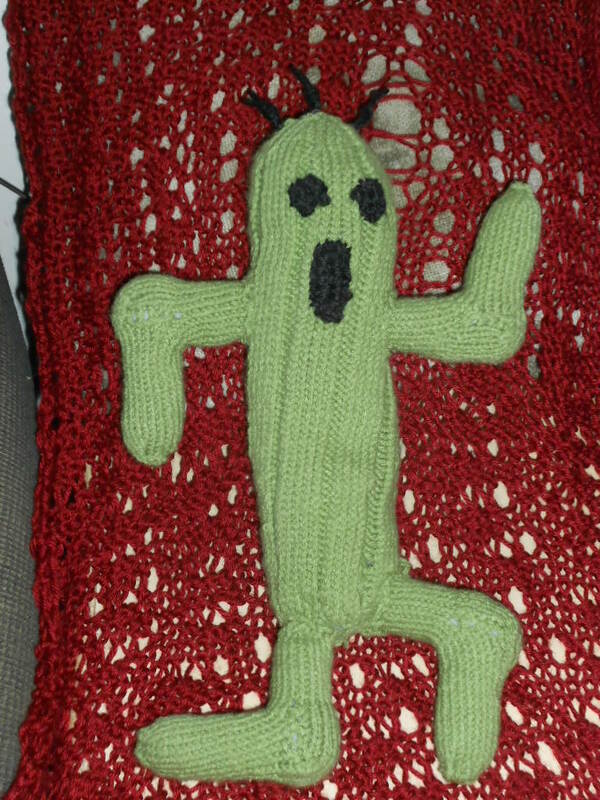 I really enjoyed them, as well as knitting the Cactuar. I hope you enjoy knitting your projects.